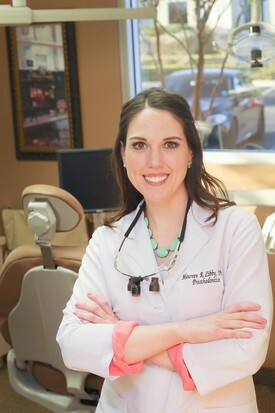 A native Floridian, Dr. Libby settled in Texas in 2011. She received an undergraduate degree in nutrition from the University of Florida in Gainesville. She continued her studies at the University of Florida, receiving her Doctor of Medical Dentistry (DMD) degree, graduating in 2009. Following dental school, Dr. Libby completed a General Practice Residency at Northwestern Memorial Hospital in Chicago. There she received training in anesthesia, endodontics, oral surgery, periodontics, prosthodontics, and implant dentistry. It was here that she found a passion for working with cancer patients and decided to pursue more oncology training. She subsequently completed an Oral Oncology Fellowship at Northwestern where she learned to care for cancer patients before, during, and after radiation and chemotherapy. She has specialized training in oral reconstruction after surgical resection or trauma. Dr. Libby then decided to further her education with a postgraduate degree in prosthodontics from the Texas A&M University Baylor College of Dentistry in Dallas, graduating in 2014. There she researched in the area of Cleft Lip and Palate. She has also completed a nationally based medical and dental needs assessment survey of Adults with Cleft Lip and/or Palate. She lectures around the country on Caring for Oncology Patients, the Development of the Face and Palate, and How to Restore Dental Implants. She is a member of the American Dental Association, Texas Dental Society, Academy of Osseointegration, and American College of Prosthodontists. Dr. Libby has been in private practice in the Stone Oak Area since 2014, and is extremely excited to start this new chapter in her career, continuing the great care Dr. McLornan has been providing to his patients. When not at work, Dr. Libby and her husband, Cody, enjoy hiking and fly fishing with their Labrador retriever, Winston.